In September 1862, Confederate leaders moved 15,000 troops northward from the Deep South into Tennessee. On September 14, they captured a Union supply depot at Iuka, Mississippi, a small town 20 miles southeast of Corinth. It was the easternmost point that the western armies of the Union had reached. The Confederates seized food, weapons, supplies, and 13,000 rounds of ammunition. 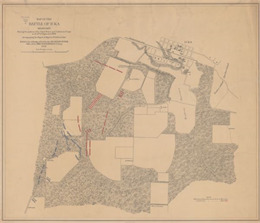 Union leaders planned a three-pronged assault to recapture Iuka and its valuable supplies. On September 19 they executed the plan, but only one force arrived in time to attack the enemy. It nevertheless pushed enemy forces out of the town after one day of heavy fighting. Afterward, the Confederates regrouped, joined with reinforcements, and prepared to attack nearby Corinth two weeks later. The 8th, 14th, and 16th Wisconsin Infantry regiments and the 8th and 12th Wisconsin Light Artillery Batteries were present at Iuka but saw little or no action. Most of the fighting was done by a Union division commanded by General Charles S. Hamilton of Fond du Lac. A graduate of West Point, Hamilton had been quickly promoted from colonel of the 3rd Wisconsin Infantry to a Brigadier General in the U.S. Army. At the Battle of Iuka, his horse was shot from under him and his sword shattered by enemy fire but he retained his composure and command throughout the fiercest combat. [Source: Report on the Nation's Civil War Battlefields (Washington, 1993); Estabrook, C. Records and Sketches of Military Organizations (Madison, 1914); Love, W. Wisconsin in the War of the Rebellion (Madison, 1866).